Internationally renowned interior designer Barry Dixon was recently in town promoting his new collaboration with C2 Paint. We ask him about his philosophy on entertaining, living life to its fullest and how to decorate with colour. 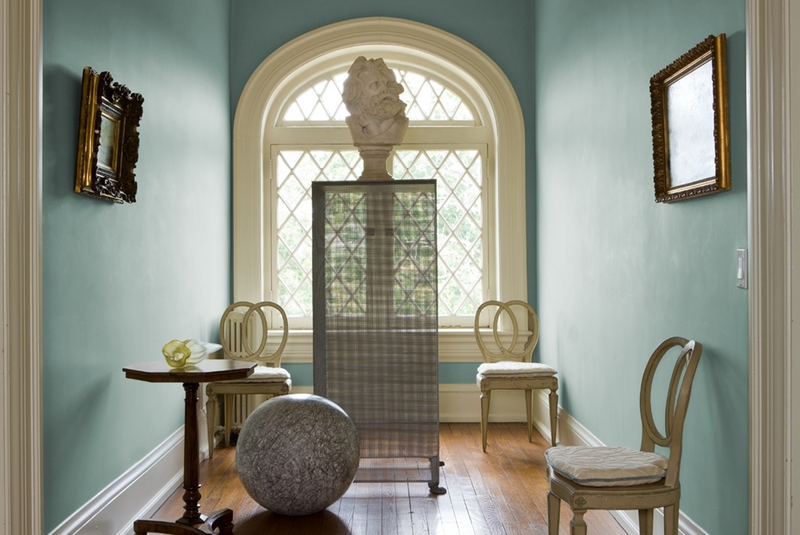 Barry Dixon is one of the most prolific and published interior designers of our time. With projects spanning the globe and product collections for the likes of Arteriors (lighting, accessories, furniture), Vervain (fabric), Averett (furniture, lighting) and Mergerian (rugs), it’s no wonder the 56-year-old powerhouse only sleeps four hours or less per night. One of his most recent collaborations is with C2 Paint, the premium brand for which he created an 84-hue collection entitled The Naturals. Based on the foundational concepts of earth, air, fire and water, these colours are inspired by the flora, fauna, objets and even weather conditions Dixon encounters working farm he owns in rural Virginia. Dixon uses C2 Paint’s Misty Morn as a clean and cool backdrop in this traditional room. Calgary-based Greg Stebbe, co-founder of C2 Paint and owner of Walls Alive on 17th Avenue S.W., recently brought Dixon to town to share his presentation “Colour and Material Culture” with members of the local design community. Interior decorator and colour enthusiast David Crosson sat down with Dixon to talk about his theories on colour. You spent time in a number of countries growing up. What inspired you most during that stage of your life? Sometimes inspiration happens around you and you’re not even aware of it. My father was a metallurgist for the Rothschilds so we moved from place to place and were constantly reimagining our households in one country with the things we’d just purchased in the previous country. That was done under the guidance of [design legends] David Hicks and Renzo Mongiardino, who put our homes together for us. At a young age I was exposed to all this and didn’t even know that, when I became an adult, it would affect what I was going to do. I was very lucky and it was serendipitous the way it came to me. Do you have any favourite countries now or are you a global hunter-gatherer when it comes to influences and inspirations? I am definitely a global magpie, feathering nests for clients with things I find all over. I think that’s really the only way we can create interiors that are timeless and hospitable. I had an epiphany years ago when I was doing lots of embassies and curating these cross-culturally pollinated pastiches for various ambassadors in Washington, DC. A home that is “present” in its own location and reflects the people who live there but also has a little something waiting for visitors from all over is a success to me. What do you feel is the greatest misconception people have about colour and using it in their homes? Well, people are just afraid of colour – and they shouldn’t be because it is the least expensive experiment you can conduct in your home. People should be more brave and take a chance once in a while; nine times out of ten it pays off and they don’t want to change it. The biggest misconception about using colour is that a dark one will make a small room smaller. I almost always go dark for the smallest rooms in a home because it camouflages the corners. They disappear and for all practical purposes that space becomes as big as the night sky. Do you think we lose our love of colour as we age? When we’re children we tend to celebrate everything colourful but as we grow older I think we just forget how beautiful colour is, how beautiful the natural world is. There are a lot of things we learn that we need to unlearn at certain points if we want to broaden our perspectives and live life to the fullest. My single favourite colour in the new [C2] collection is Michael’s Moon; it’s a light neutral that can appear grey or even slightly green. Or, in some lights, as a neutral beige. It’s rich in every sense and works beautifully from day to night. I love colours that change with the light of day. I also have a favourite range I employ which encompass the happiness and insouciance of citrus colours. I don’t like a lot of primary or straightforward colours – I like ones that are nuanced in tone, like an interesting person who lets you see aspects of their personality over time. Colour is used very judiciously in your work, either as a supporting element or in some cases with muted intensity; do you have a rule of thumb when it comes to those proportions in a space? I have more rules of thumb for a whole house than I necessarily have for an individual space. I think it’s too easy to paint all the rooms off-white and say, “That’s fine, I’m just going to let my art provide the colour and maybe bring in some fabrics.” Even if I do an all-white house I never use the same white; they’ll be different from room to room. I also go back to that elemental thing – earth, air, fire and water – and always keep those in play in the back of my mind. I see colour and fabric as extensions of the natural world and use them as tools to tell the story of a house. Despite extensive travel you are a Southern gentleman at heart; how has that influenced your aesthetic? Well, I referenced hospitality earlier in our conversation and it is so important. One of the quotes excerpted a lot from my first book is essentially that no home, no matter how beautiful, isn’t a success if it doesn’t have a quality of innate hospitality. A home should involve a sense of invitation, otherwise it’s like a beautiful person who doesn’t have a soul. Diana Vreeland famously said “Elegance is refusal;” what is Barry Dixon’s definition of elegance? I think elegance is inclusion-the tapestries that we weave by pulling threads from all different eras and places. It’s about rich notions and cross-references in layers and layers of thoughtful design. Also, the best interiors are not given away at the front door, either; they represent a voyage of discovery as people travel the spaces inside. Final thoughts – the ingredients for a happy life are…? Travel, food and love. Travel is vital. Food is the essence of life – but you have to treat yourself and realize it’s not just fuel. As long as you keep yourself within a range of healthfulness then food is such a great thing. And by love I’m talking about your significant other, your family, your animals, your neighbours, the people you work with. There is a happiness that can only come from being close to other human beings and understanding that no man is an island.